Storage and organization is a major factor in all our building decisions. Everything needs to fit well, but also be accessible. 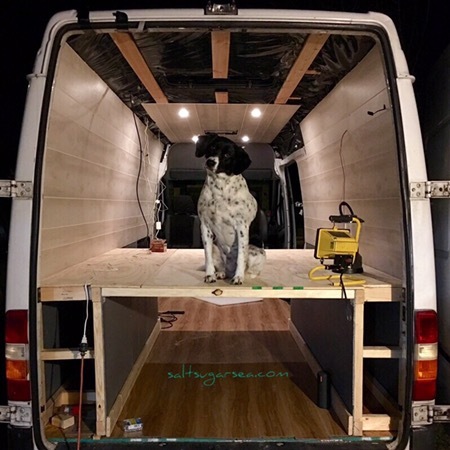 The under bed storage area of the van conversion is very important. This is our garage, our trunk. The biggest area we have to use for storage ideas. No space can go wasted, we need it all. Our original “under the bed storage” design was built to hold large items in an open middle space, and small items in side compartments. The idea was to have lots of room to store many items. The wide open middle space could hold many IKEA boxes that would organize our necessities while we were in the process of building more permanent storage solutions. The space would be big enough to also hold our body bag sized duffel of snowboard gear, surf gear, a small BBQ grill, and our travel stove. On either side of the open middle space, we built frames to fit over the wheel wells. The frames served as support for our bed, and to store smaller items easily out of the way. It seemed like a reasonable storage design. But what actually happened was the middle stuff toppled into each other, and it was impossible to reach anything that went into the side spaces. I got a big pack of diapers pushed snuggly over the wheel well, stoked that no space would go unused……but then I needed them. 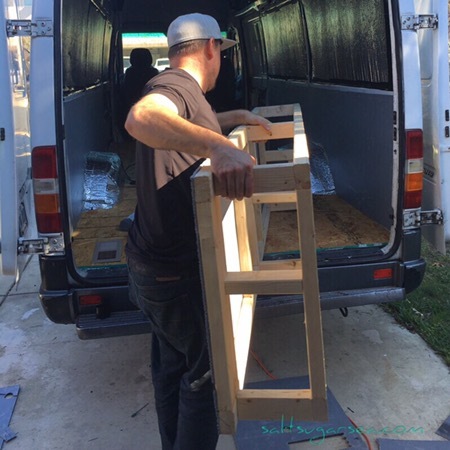 While way too many hours have gone to moving stuff in and out of the van, hitting the road before finishing our Sprinter Van conversion, has actual proven beneficial. 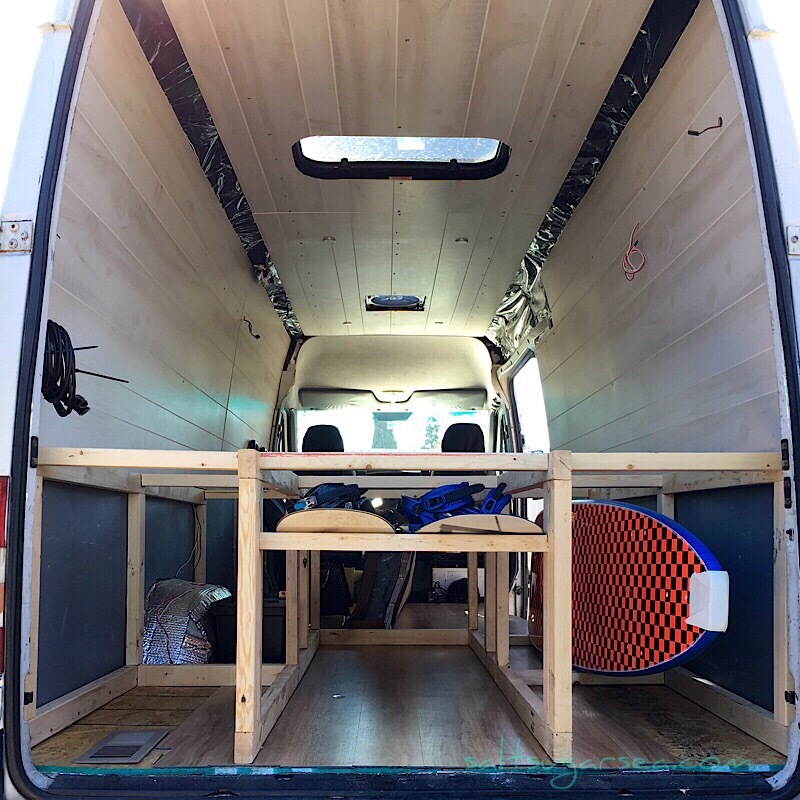 It’s given us the opportunity to see what works, what doesn’t, and custom build our storage to fit the things we have with us….. like a new big blue 8ft foamy long board The Husband just bought me. Thanks babe! So a redesign was in order. We tore apart the bed and expanded both sides. One to hold surf boards and tool boxes, the other separated into 2 parts with solar battery stuff in the back and miscellaneous wet suits and snowboard boots in the front. 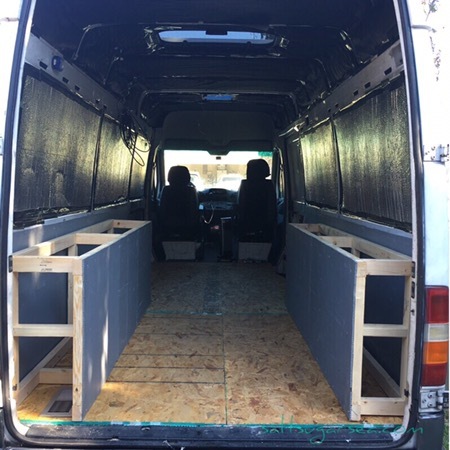 We added a top shelf to the middle compartment to hold the snowboards, and we’re thinking pull out drawers to finish out the middle part on the inside side of the van. Much better so far! Check out the headboard and nightstand shelf we added next! 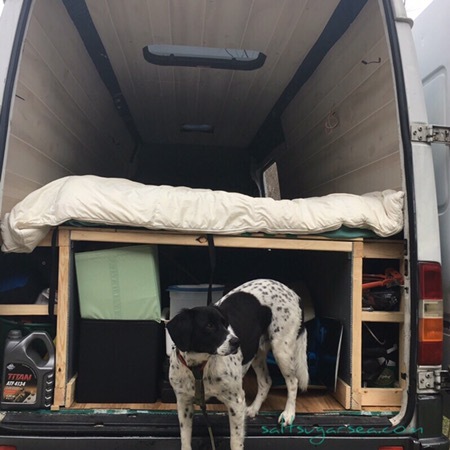 Previous Post: « Vanlife, moving to the beach!